If you have friends or family coming over for an unexpected Sunday dinner at your house, don’t be alarmed. You may already have what you need and have to look no further than your front porch. I couldn’t bear to just let the beautiful green Hokkaido pumpkin go to waste that we brought home from Rennick’s Family Farm a few weekends ago. I came up with a dinner that requires almost no clean up aside from a pasta pot, but is still kind of a showstopper. You’ll be surprised how easy this recipe is, requiring only about 15 minutes of hands-on time. Italian sausage, mushrooms, sun-dried tomatoes and lots of fresh sage and thyme roasted in the pumpkin for about an hour turns these ingredients into a melange of marvelous Fall flavors for a bed of pasta. Serve with a nice wine, some crusty ciabatta and a good olive oil, you’ll have a table full of happy company amazed at your skill in the kitchen. Preheat oven to 325 degrees. Remove the top from the pumpkin like you would a Jack-o-lantern. This time, I had Hades do this. Scoop out all the stringy insides along with all the seeds. I’m drying and saving the seeds. I think I’ll try to plant them next spring. Fingers crossed. 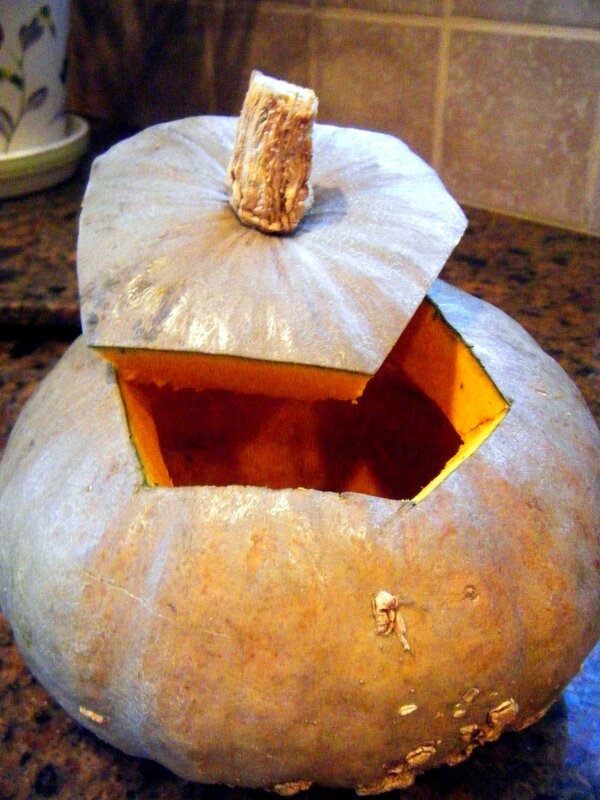 Drizzle some olive oil and salt and pepper into the cavity of the pumpkin and rub to coat the inside. In a bowl, combine sausage through sage and thyme then drizzle with a bit of olive oil, add a good splash of balsamic and generous pinches of salt and pepper. Stuff pumpkin with mixture. Place on a sheet or roasting pan lined with foil. Roast for an hour and 15 minutes or until tender for the medium pumpkins. Remove the squash from the oven, place in a serving bowl. Serve family style at the table, by scooping and mixing the pumpkin along with the sausage (there is a fair amount of good liquid down towards the bottom, mix to incorporate all this). Serve a scoop or two of the mixture on top of the pasta, sprinkle with parmesan. Playlist included Cameras, by Matt and Kim. This makes for a great dance party in the kitchen after you get the pumpkin in the oven. I don’t know. It just works. Give it a try. Gorgeous idea, love the presentation. 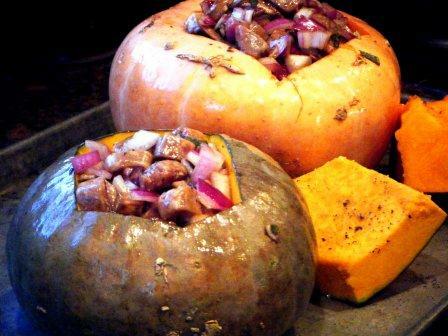 Never thought of utilizing the pumpkin as a cooking vessel… brilliant!